Self cleaning filter is constructed of filter housing, filter element, back flushing valve, differential pressure gauge, differential pressure switch, Dust Extraction assembly,Geared motor with Sensor and Control Panel. Filter housing can be offered in various material of construction such as various grades of stainless steel, carbon steel and alloy metal. Filter element can be offered in wedge wire, multi layered wiremesh, and plain wiremesh configuration, depending upon process requirement. These filters can offer filtration level starting from 1 micron to 2000 micron. They are designed to deliver flow rate up to 2000 m3/hr or even more than that with parallel configuration. Auto self cleaning filters are designed for flow direction from inside to outside. Contaminated fluid enters into filter housing through inlet connection. 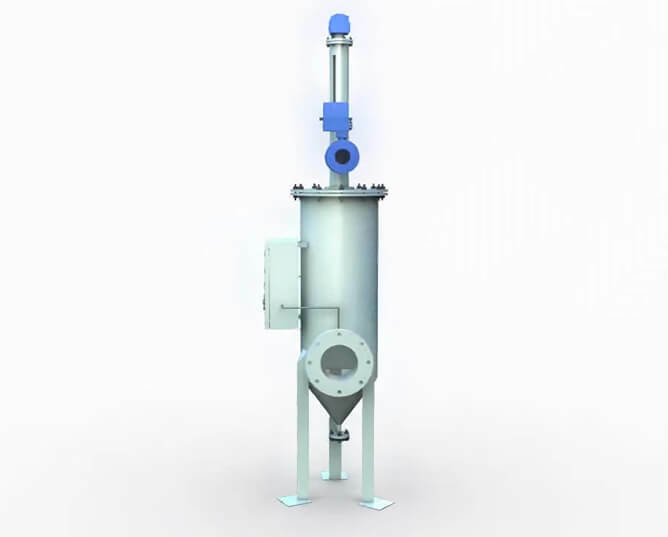 It passes throughout the inner surface of filter element, where suspended particles of defined micron rating retained inside & clear filtered material comes out from filter housing through outlet connection. Suspended particles retained inside filter element create a layer of debris, resulting increase in differential pressure. 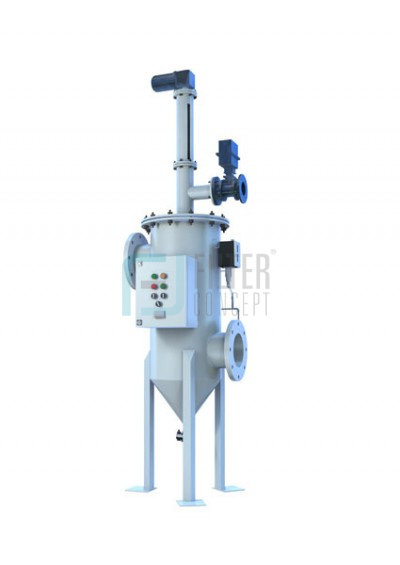 Filter element cleaning mechanism constructed of dust extraction assembly, which rotates inside the surface of filter element &moves upward‐ downward to ensure proper cleaning of filter element throughout the area. Dust extraction assembly is constructed of precisely designed nozzles at pre‐defined distance from filter element surface. Such nozzles are equally placed perpendicular with center pipe, which rotates with the help of geared motor at defined speed. Dust extraction assembly is also connected with back flush valve that has finally open end to the atmosphere. Once differential pressure reaches to its pre set level, control panel send signal to back flushing valve to open. With pressure difference within filter element & atmospheric pressure outside, it creates high suction inside the filter element. Due to this suction pressure, debris/cake deposited on element surface is pulled out through nozzles & finally discharge from filter housing through flushing line. With high velocity of water within nozzle create a jet pressure to remove sticky cake deposition even with small opening. This entire process of back flushing completed within 30 – 60 seconds depends upon size of filter element.